This story came to us via Lauren @ourwholeclan on Instagram, where she chronicles the Whole30 meals she makes for her family. I heard about the Whole30 while I was in labor with my seventh (yes, SEVENTH) child. You know: active labor, with preeclampsia, an extra 40 pounds, worrying about my health and future and exhausted, in all of my sweaty glory. It was THAT MOMENT my nurse started chatting about her quest to find Cleveland’s best pizza joint. She was starting a Whole30 on Monday and wanted to have one more slice before then. “What is the Whole30?” I managed to ask. She gave me her description of this whole-food program that I had never heard of. She talked about The Whole30 book and the grocery shopping trip she’d taken in preparation. Come hell or high water, she was starting Monday. #Whole30 with a family of 9? 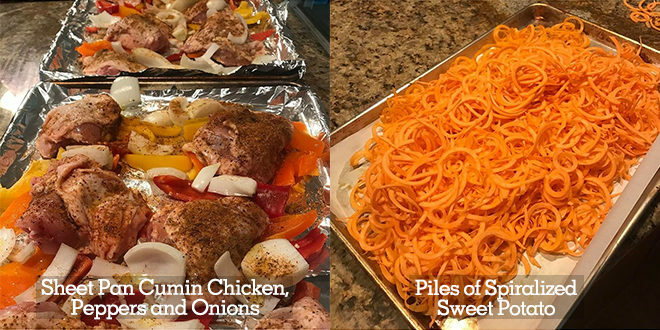 Lauren shares her best meal prep, budget, & kiddo tips. Everything went in one ear and out the other. 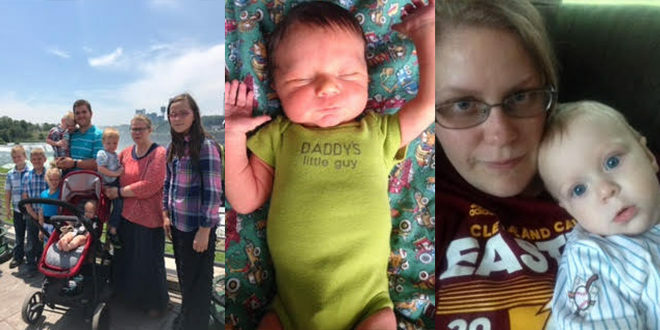 My son was born about 20 minutes later, and my days and nights became a blur as our family tally rose to seven kids under 11 years of age. It wasn’t until the Saturday before the Superbowl that I thought about the Whole30 again. I should have been planning our party menu, but instead I was Googling. I found the Whole30 rules; researched to see if it was safe for nursing moms; and figured out the meaning behind the “30.” I began to wonder: did I have it in me to complete a Whole30? I texted my husband Joe with images explaining which foods are and are not compliant with the Whole30 rules. He wasn’t thrilled, but I didn’t care. My mind was made up. With TONS of Superbowl party leftovers in the refrigerator, we started on Monday. Here’s an example: I learned that I was majorly overthinking meals for my family. When we first started I thought I needed to go and buy all the of the specialty items right away and plan elaborate meals. But in the end, I learned it makes the most sense to stick to basics. We really only need one protein, one carbohydrate, and one vegetable to make a meal satisfying, with maybe one or two of our favorite Whole30 Approved items. Once I figured this out, I knew I was building a foundation of healthy eating habits for life! Doing this on a budget is possible when you know where to shop for large amounts of produce and meat at good prices. You have to be willing to shop around and visit a few stores to get the best prices. Food terminals are a big family’s best asset! I would find deals like 40 pounds of sweet potatoes for $11. Sometimes they even sell a huge box of very ripe ORGANIC produce for five dollars or less. Restaurant Depots have great deals on produce as well, if you are willing to invest in a membership. If you are feeding a large family you’re probably already shopping at a wholesale club. Costco is my personal favorite. They have the best deals on coconut oil and Whole30 compliant almond butter that I have come across. I also shop at Aldi; their eggs are really good and sometimes are as cheap as 59 cents a dozen! Their produce is decently priced, and if you can’t find affordable avocados there, then they currently aren’t in season. Once I’ve got my groceries for the week, we do a Cooking Day. We prep and prepare many different proteins and veggies for the week; this is especially necessary during weeks where lots of cooking on the fly definitely won’t happen. My older kids are always more than willing to participate in the Cooking Day team effort. One of my favorite Cooking Day strategies is roasting a bunch of whole chickens, shredding them, and having them on hand to turn into salads or lettuce wraps. Cooking Day allows us to have food on hand so my kids have quick options when hunger strikes. There are some days I feel like I’m always in the kitchen, but that’s just how it is when feeding a large family. The key is meal prep. In general, I am an unorganized, scatter-brained individual. Thinking about planning meals in advance never came easy to me, even with as many kids as we have. Today, it’s become a natural instinct as we’ve developed our grocery shopping habits and strategies like Cooking Day. I get the kids involved with prep and cooking… they really enjoy helping. Whether its boiling 2 dozen eggs or peeling veggies, my older kids are always more than willing to participate in the team effort. The oldest three children take turns cleaning the kitchen after dinner, and they are quite good at it! The oldest two take turns unloading the dishwasher. When we go anywhere we are prepared with readily-available Whole30 compliant food. We pack a cooler or backpack full of snacks. We like carrots, cucumbers, Wholly guacamole packs, raisins, apples and almond butter, homemade “Daniel bars” (made by our Uncle Daniel!) or fruit-and-nut bars. I always make sure we have water. We leave cases of both still and sparkling water in the van under the seat and hide it under a blanket to protect it from the heat and sun. A typical day starts with preparing a simple breakfast. We usually saute some red skinned potatoes in coconut oil, season them, add some greens, and scramble eggs or throw an egg on it! On busier mornings we simply reheat egg cups that I’ve prepared and keep in the frig. Lunch is usually something like a taco or chili-style ground meat over salad with all of the works (including tomatoes, onions, cilantro, hot sauce, and an avocado), and maybe a small drizzle of Tessemae’s Creamy Ranch salad dressing. Dinner is usually a grilled or baked protein, frozen veggie medley, and a sweet potato. Weekends we make super special by using the compliant bacon that everyone loves so much. In terms of sticking to the Whole30 rules, I am a bit more lax with our children. They’re obviously not doing a Whole30 for the same reasons an adult would. We allow them to have healthier treats once in awhile; for example I made banana “pancakes” for them once when I had a bunch of bananas that were going bad. I’ll also occasionally get them compliant pork rinds for a crunchy snack and once in awhile we’ll give them compliant kombucha. They love it. I expected us to have bad moods when doing our Whole30, but it had the opposite effect. On the toughest days we just joked around about what we missed until rough times passed. The kids have liked most of the Whole30 meals (omit Veronica, my six-year-old here). One of our favorite dinners is beef bolognaise over sweet potato noodles. Joe loves chicken, so I’ve learned a bunch of chicken recipes. Another family favorite is chili or taco meat over salad. We also enjoy buffalo chicken thighs. And, we love Mexican flavors in this house so throwing chicken in the crockpot and then dressing it up with all of the Mexican-inspired fixings is my thing. I highly recommend having a spiralizer. We use ours almost weekly. 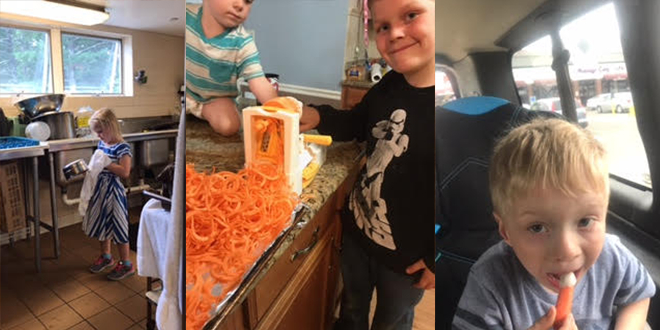 Our ten-year-old loves cranking out zoodles and sweet potato noodles for the whole family. A crockpot is something most large families already have in their kitchen to make their lives easier. I think it is a quintessential tool for large families. Plastic storage container bins for mass prep are extremely useful. Another go-to kitchen item I rely on completely are my sheet pans. I literally throw food on them in mass quantities and cook it all at one time. We do chicken, asparagus, sweet potatoes all at one time and bake. We also rely heavily upon our large nonstick pans, as we can cook up mass amounts of eggs, potatoes and other dishes without needing a lot of cooking fat. I just recently got an Instant Pot and I could probably write a whole article on how fabulous it is. It’s life changing! I’m not sure why I only just now jumped on the bandwagon, but wow. This appliance makes our family Whole30s so much easier. This isn’t a walk in the park, but it’s not hard either. If you want it bad enough for your family then you can do it with your family! Do it now, during the summer, while school is out and you are reaping the benefits from your own garden. Produce prices are also the lowest they go during the summer. There is no time like the present. Some links in this post are affiliate links, which means Whole30 makes a small commission on items purchased via these links. Thank you for supporting our Whole30 Approved partners.